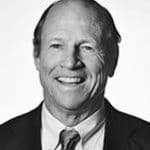 R. William "Bill" Ide is partner at Dentons US LLP. Mr. Ide focuses his practice on representing boards of directors, audit committees and management with corporate governance, special investigations, crisis management, ethics and strategic projects. Mr. Ide formerly served as senior vice president and General Counsel of Monsanto Company (NYSE: MON), Counsel to the United States Olympic Committee and President of the American Bar Association. He is a graduate of University of Virginia.